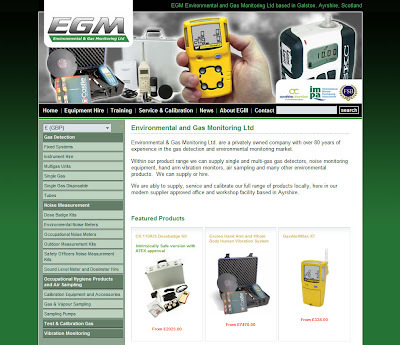 Ayrshire based supplier of Environmental and Gas Monitoring products, EGM Ltd, has this week launched their new eCommerce website. EGM operated their own website for a number of years which was successful at providing visitors with product information but the availability of new technology and a more demanding marketing strategy dictated that a new website was required. Following meetings to discuss the overall business strategy and the part the website would play in this our proposals were accepted and timescales agreed. The new website is fully eCommerce enabled allowing EGM to sell products to new and existing customers worldwide. The online store software allows visitors to change the currency display on the website and the advanced shipping system allows EGM to specify the shipping costs to any country. One of EGM's new innovations is to make equipment available for hire and customers can arrange this with online payments. As well as control of all products and descriptions on the website th online store software also gives EGM full control over the text and images of all the additional pages. This means they can react quickly to any situation ensuring the website is always up to date and new products and information is immediately available for customers. Embracing Web 2.0 technology and some clever coding from The Edge allows EGM to run a Blog and Newsdesk simultaneously. Finally, the icing on the cake was provided by giving the slightly dated looking EGM logo a new look. The Edge are pleased to announce the launch of the new website for their latest client Dark Star. This dynamic, energetic and youthful pub, club & hotel group is based in Glasgow and is probably best known for it’s Budda bar's in the city centre of Glasgow. Since 2007 the group has been evolving by acquiring many new sites across Scotland, stretching from Ayr to Aberdeen. This evolution has seen the creation of a powerful brand identity which Dark Star were very use to create an online space which their clientele would view as an extension of their customer experience. To make this happen they needed to work with a web development company who would pick this concept up and run with it. This is where The Edge came in, using the latest social media tools to create picture sharing galleries, blogs, video channels and even online restaurant and hotel bookings. The end result is a website which showcases all of the Dark Star properties and lets customers interact with the brand in a variety of ways, and by harnessing the power of Web 2.0, the customers can actually create content for the site itself. "We know our customers enjoy the experience when they are in our pubs & clubs, and with the help of The Edge, we have created a unique online space where they can share their great times with their friends whenever they want"
Dark Star and The Edge will continue to push the boundaries to ensure that the online Dark Star experience is as exciting and fun as the real thing. For more information on how to give your online strategy the Edge, contact James Kennedy on 01292-521-404, info@getheedgeonline.com. According to this morning's Scotsman, The Scottish Government have refuted claims the advert for the Year of Homecoming, which features Sir Sean Connery, will be broadcast only in Scotland. The James Bond actor, and Sports Personality of the Year Chris Hoy, are among the famous faces who feature in the minute-long advert, which also stars actor Brian Cox, golfer Sam Torrance and singers Lulu and Amy Macdonald. The advert, which also features Scotland rugby players Kelly Brown and Thom Evans, was broadcast across Scotland for a week from the end of November but there has been criticism that the advert is not being televised outside Scotland, particularly in countries such as Canada and Australia. Anyway, it appears that the advert for Scottish tourism (because that is apparently what it is) will screen in UK cinemas from January. The more worrying statement comes from "a source close to the First Minister" who stated without a hint of irony apparently, "Thanks to the hard work of this administration, Homecoming will now be a fantastic series of over 300 events, engaging the entire Scots Diaspora and the whole array of our international connections, giving us a huge tourism boost in 2009." Nothing to do with the private sector, or councils or partnerships all over the country then? So says, Proffessor John Lennon of the Moffat Centre for Travel & Tourism at Glasgow Caledonian University. Professor Lennon was amongst a number of speakers at the recent Scottish Tourism Forum's networking event "Surviving the Crunch" at the Royal Hotel, Bridge of Allan. "Value and Quality will deliver growth"
"Your website strategy needs to keep moving"
Both Prof John Lennon and Neil McLean from Smallmedialarge highlighted the need for tourism websites to embrace the latest developments in Social Networking, Photo & Video Sharing & Blogging in order to identify new customers segments and to help with ranking in search engines. They also agreed that the weakness of the GBP against the Dollar and the Euro would see an influx of North American and European travellers in 2009 and that booking engines which easily allowed for currency conversion would be the main beneficiaries. David Smith, owner of the Buccleuch Arms Hotel in Moffat and Debbie Taylor, General Manager of the Old Course Hotel & Spa in St Andrews both spoke of the need to stay true to the principles of quality and service and find innovative ways to use latent staff skills and enthusiasm to upsell. Who is going to support the already stressed out, time poor, small and medium accommodation providers in Scotland to take advantage of these new opportunities.? Many of them already feel totally overwhelmed by the information overload from third party distribution websites and spend too much time constantly updating their rates and trying to gain a competitive advantage on their neighbours. Does this really help ? No, all it does is help to keep the third party distribution websites content nice and fresh, with their customers coming back time and again to make a booking..... and, here's the crunch, the small and medium operators are paying upwards of 15% per booking for this. Who is really winning here ? And here at The Edge, we are doing just that, we already have many customers whom we have created online strategies for, built around Web 2.0 best in breed applications such as Picasa, Flicker, Youtube, Facebook and Blogger. Contact us today on info@gettheedgeonline.com to find out how to give your business the Edge. So says, Proffessor John Lennon of the Moffat Centre for Travel & Tourism as Glasgow Caledonian University. Did you see the X Factor on Saturday then? The moment we'd all been waiting for finally arrived. And what was it all about? A good song mangled by a mix of too clever camera work, over editing, poor sound quality, disjointed choreography, a lack of passion and quite clearly some very bad attempts at lip synching all the way through.